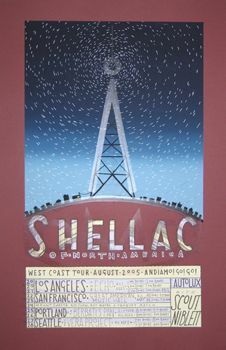 20-21-22/08/05 @ The Echo, Los Angeles, CA, USA. 22-23/08/05 @ Great American Music Hall, San Francisco, CA, USA. 25/26/08/05 @ Berbati's Pan, Portland, OR, USA. 27-28/08/05 @ The Vera Project, Seattle, WA, USA. Silkscreen. nine screens on French brand cover weight paper. Edition of 270. Signed and numbered by Jay Ryan.